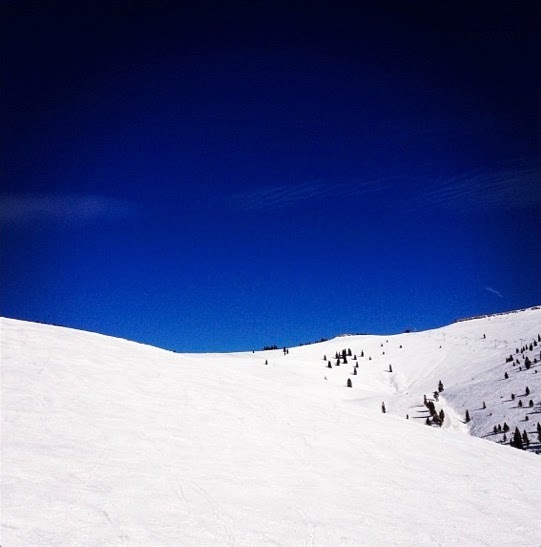 Over the holidays, my family and I headed back to the powdery slopes of Aspen and Vail. 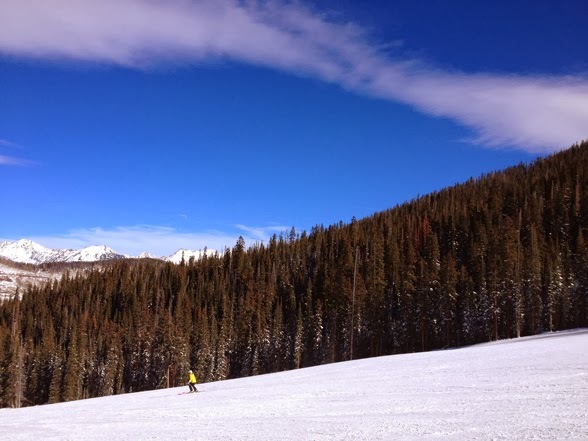 This trip to the Rockies definitely amped up my newbie confidence and aptitude, which is to say I can almost keep up with my sons, though my 4-year-old did manage to beat me in an official slalom race (truth be told, I performed so terribly I missed a gate and got disqualified!). Those heart-thumping, white-knuckled jaunts through steeper terrain were padded by numerous hot chocolate breaks, yummy lunches at lodges perched high atop the mountains, and an apres-ski glass of red wine at the bottom. Herewith, more of my Rocky Mountain-high moments. We were blessed with mostly good weather throughout our trip--cobalt blue skies, lots of sunshine and temps in the low 30s with an occasional night of snow as well. All of which made the snowy scenery even more sublime. The runs in Aspen were so beautiful I had to stop mid-action to take pictures, which drove my speed demon ski mates (i.e., my kiddos!) a little crazy. We celebrated New Years Eve in Aspen with friends and children by watching fireworks, drinking champagne, indulging in mounds of caviar, and sporting some cool new eyewear. Fun! 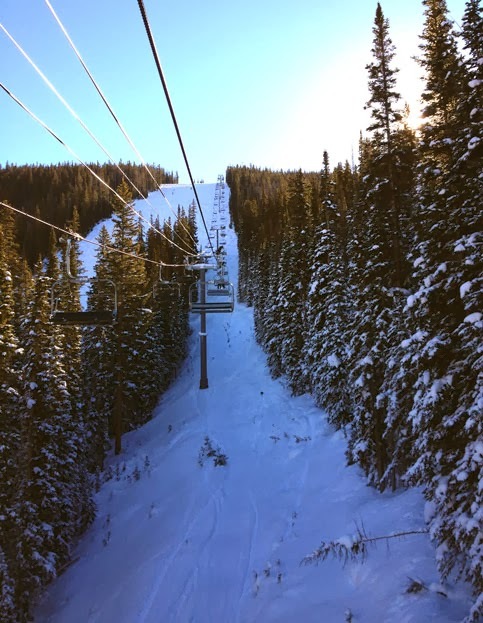 On New Years Day we arrived in Vail, where a snowstorm had just dumped several inches of powder. The excellent conditions emboldened my first foray to the back bowls, which had an other worldly feeling to it. 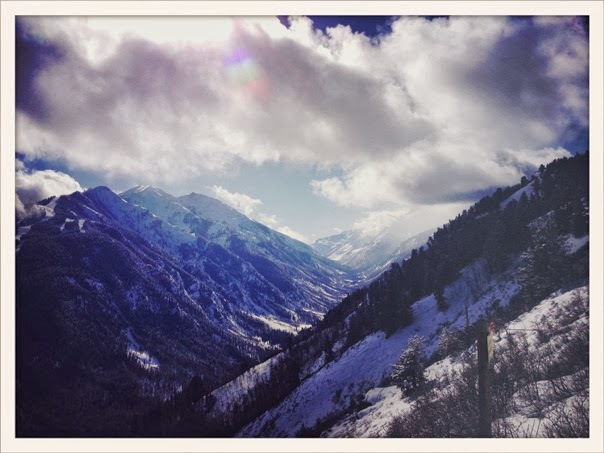 Venturing into new steeper territory meant higher chair lifts, some of which afforded the most amazing views. 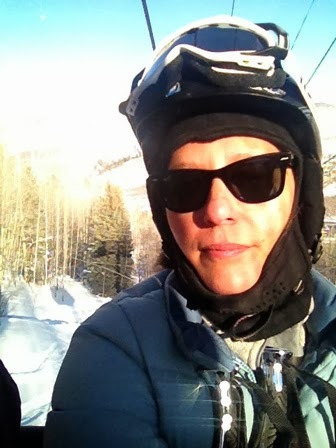 A part of me, namely my quadriceps, wanted to tour Vail via chair lift rather than my own two skis. 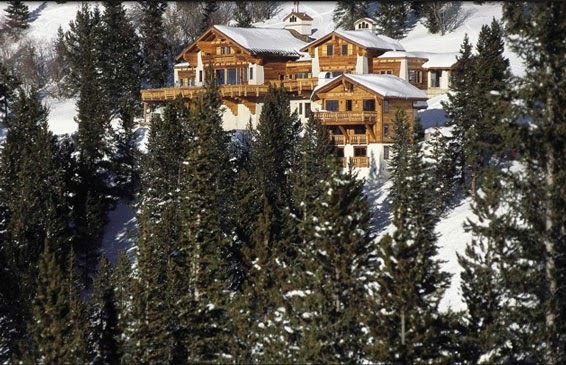 In Vail, we lunched every day at a friend's club, above, which, in order to get to, required skiing some steep runs or hiking up to with your skis (one could take a snow cat, but my adrenalin-seeking co-skiers would not even consider it an option!). Once there, you are greeted with a cup of hot mulled wine and slippers to change into. That mulled wine was like my carrot on a stick--the idea of it lubricated my engine and courage! At 8,150 feet above sea level, I pretty much forsook most of LE CATCH's style tenets to stave off hypothermia. 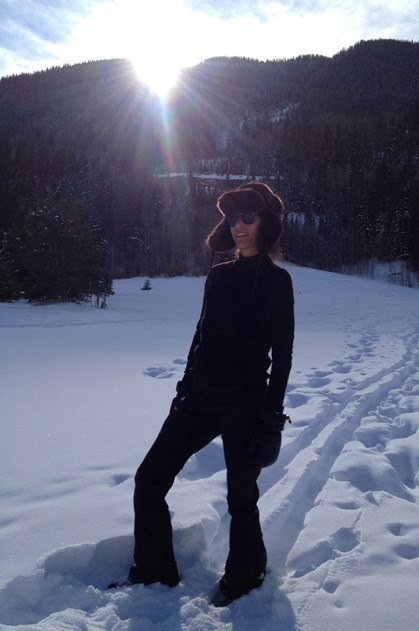 In Aspen, I borrowed a friend's US Ski Team puffy jacket, which, sadly, did not have the effect of making me look more like an expert, as my skills screamed intermediate skier! In Vail, I borrowed another friend's light blue puffer, which made me look less US Ski Team, more Apollo Mission. However, off the slopes and even with ski pants on, I tried my best to make a style statement. A classic black cashmere turtleneck and lush fur trapper hat like this helped a bit! Love your pom pom trimmed sweater in the NYE photo! Where did you find that beauty? wow! love all these pics. 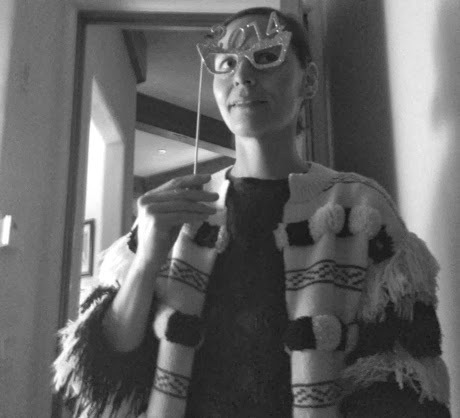 can you please ID the fabulous fringe cardigan you are wearing on NYE? also, what brand of duck boots do you have? thank you! Hi, hi! Happily defrosting here in LA! Love the photos and wanted to say thanks for coming to ski on my home mountains! I live in Boulder, CO, but ski many weekends at Vail. Looks like you had a great time, the snow has been excellent! thank you! did you find the sorel boots to run tts or big? What pants are you wearing in the first pic? Thanks! hi! i am wearing an old pair of coated jeans from Zara and my faux fur jacket is old H&M. I am from Colorado and my sister lives right outside of Vail, you made me homesick! I am so glad you had a good time. You changed your lettering! Looks great and welcome home! I love seeing these pictures from your vacation! You look super-chic in the last photo (with the black turtleneck and fur hat)! I prefer warmer vacations, myself, but it looks like you had a wonderful time! That last picture -- so chic! What ski pants are you wearing? My ski pants are by North Face. I am in the market for a new more streamlined pair!